Buy Linwoods Milled (Ground) Chia Seeds - 200g in the UK from our online shop or directly from our independent Scottish store. With its versatility and mild flavour, Chia seed is a beneficial addition to your diet, naturally. Chia seed is one of the highest natural sources of Omega 3 and Dietary Fibre and also contains 21g of Protein per 100g which contributes to the growth and maintenance of muscle mass and normal healthy bones. 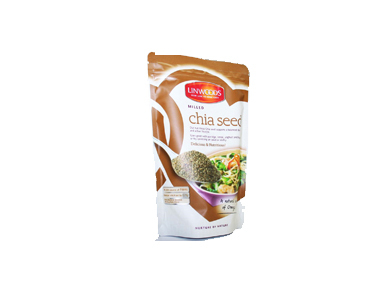 With its versatility and mild flavour, Chia seed is a beneficial addition to your diet, naturally. We sell real Linwoods and other Seeds directly from our shop in Scotland and online throughout the UK. View more products from Linwoods. Where can you buy real Milled Chia Seeds safely online? If you are wondering where you can buy Linwoods Milled (Ground) Chia Seeds - 200g safely online in the UK, then shop with us. We are an actual health foods shop; with real people selling real foods and products. Our award-winning independent shop is located in Stirling, Scotland since 1976. You can buy our Seeds in store or safely place an order with us online or over the phone. Milled Chia Seeds - Linwoods Milled (Ground) Chia Seeds - 200g in Seeds and Foods.